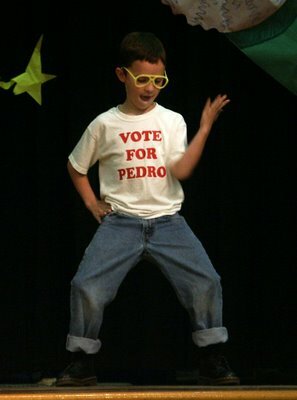 The Glenwood talent show was today, and as a departure from the long string of pianists, violinists, and hoola-hoopists, Tristan decided to bust a move, Napoleon Dynamite-style. He did a great job and enjoyed an enthusiastic response from the several hundred students, teachers, and parents. I wonder how many of them had any idea what he was doing. . . .